If you are a lover of shortbread cookies you are going to adore these Orange Pistachio Shortbread Bars. Buttery, melt in your mouth cookie bars with a punch of orange flavor and crunch of salty pistachios. I’m back with another delicious treat for Christmas cookie week and I’m not going to lie, it’s my favorite one for the week. I love a buttery, crumbly shortbread cookie and these Orange Pistachio Shortbread Bars have all those things and more. Basic shortbread has a super simple and short ingredient list usually consisting of butter, sugar, flour and salt. That means shortbread any time you crave it. This shortbread bar has the addition of orange zest and pistachios to make it festive and extra flavorful for the holidays. I’m a big fan of orange in my sweets so I especially love the sweet, citrus flavor the orange lends to this shortbread. I know this can be a polarizing opinion but I love nuts in my baked goods. Where do you fall on the debate? The pistachios add a nice little crunch and are a little more festive for the holidays than a pecan or walnut. If you don’t care for nuts you can definitely leave them out and they will still be crazy good. Different shortbread cookies use different sugars but for me, I prefer powdered sugar over granulated or brown sugar. The light, airiness of powdered sugar gives a shortbread recipe an even lighter, melt in your mouth texture. Not only do these taste amazing but they are super simple to make too. First the butter and powdered sugar are creamed together until the mixture is super light, fluffy and white in color. This takes about 3 minutes. Then the orange zest, cornstarch and flour get mixed in until it just comes together. Lastly, the pistachios are added. At this point the dough is pretty thick and it may be difficult to mix them in. I gently kneaded them in with my hands which worked perfectly. Press the dough into an 8×8 pan and into the oven they go. When a cookie takes less than 10 minutes from grabbing out the ingredients to into the oven you know you’ve got a winner on your hands. I baked them until the edges juuust started to turn slightly golden. This ensures they are cooked through but not too hard or crumbly. Shortbread perfection. Sliced into perfect squares these will be so pretty added to your Christmas cookie tins. And now I’m off to package these up and send them away because my self-control is lacking around shortbread. 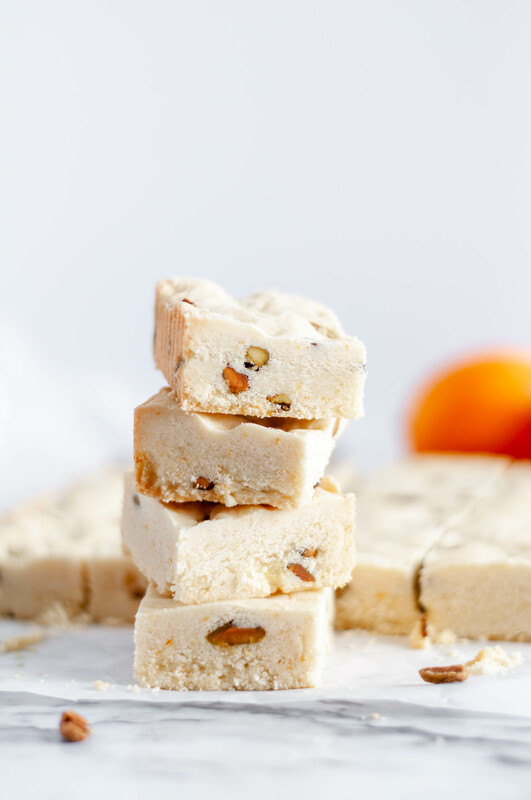 Orange Pistachio Shortbread Bars are a delicious, festive and simple cookie bar that you need to make this Christmas. Melt in your mouth delicious and oh so buttery. Preheat oven to 325 degrees F. In a stand mixture, cream together butter and powdered sugar for 3 minutes, until super light and fluffy. Add cornstarch, flour and orange zest to mixture and mix until dough just forms a ball. Stir in pistachios. You may need to somewhat knead them in with your hands. Press dough into an 8x8 pan. Bake for 30 to 35 minutes until the edges just start to turn golden. Remove from oven and cool completely on a cooling rack. Run a butter knife around the edges then remove from pan. Slice into 16 even square bars. Store in airtight container. Oh boy, these look amazing!